Inverto red extended quad LNB so štyrmi výstupmi pre pripojenie TV / STB cez Koaxiálny kábel. 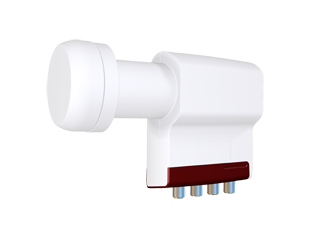 Specifically designed for the European DTH markets, this LNB provides optimized reception capabilities. It is designed to address the need to support multiple LNBs installations (on a single dish antenna). This LNB makes it possible to place two 40mm brackets on its prolonged neck. The LNB enables the reception of signals from one satellite and its distribution to maximum four Set Top Boxes with Single Tuner (or two STBs with Twin Tuner). Furthermore, it is ready for High-Definition transmissions and provides excellent Noise Figure performance. Designed to meet strict specifications and manufactured to the highest industry quality standards, this LNB is an ideal solution for satellite broadcast reception across Europe. Dlhý držiak LNB pre pripojenie viacerých LNB na parabolu.